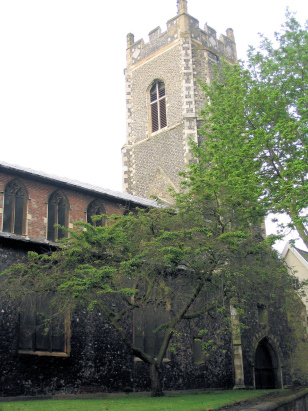 The parish of St George Tombland is at the ancient Saxon heart of the city of Norwich. Sited on Tombland where the original market was held it is now directly opposite the St Ethelbert's Gate of the Norman Cathedral. 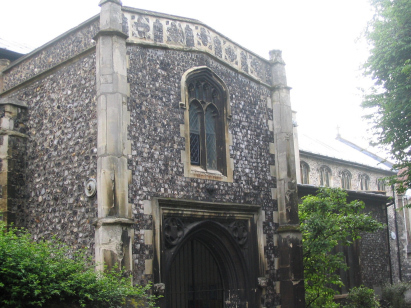 Like most of the many parishes of the city St George Tombland covered a physically tiny space with many other churches within a matter of a few hundred yards. By the city standards this was a relatively prosperous quarter, the haunt of professionals and the middle classes - there were labourers and weavers but not the packed yards of some parishes. The parish consequently had a relatively light population making for one of the smaller transcripts for a city parish. St George Tombland sits, slightly set back, on the edge of the old Tombland market site. The church is heavily restored by the Victorians and lacks many features which could give a date. From documentary sources Pevsner dates the tower to the 15th century with 17th century decorations and window styles are consistent with a period around the cusp of the Decorated and Perpendicular change. The site is rather hemmed in by buildings making for a tricky building to adequately obtain panoramic views. A single standard 800-entry register book covers the period of the transcript and indeed runs onwards to 1895. This register, whilst previously available only on a poor fiche, has recently been re-filmed on Microfilm MFRO351 in the collection of the Norfolk Record Office and from which this transcript was prepared. This newer film is of much better quality with all the benefits of modern filming techniques. As a consequence the registers only challenges are the standard of writing which at times is challenging. Fortunately any poor hand is usually short-lived as many clerks have contributed to these entries. Subject to that caveat this was a straightforward transcript to prepare and it is to be hoped few errors will have crept into its preparation.